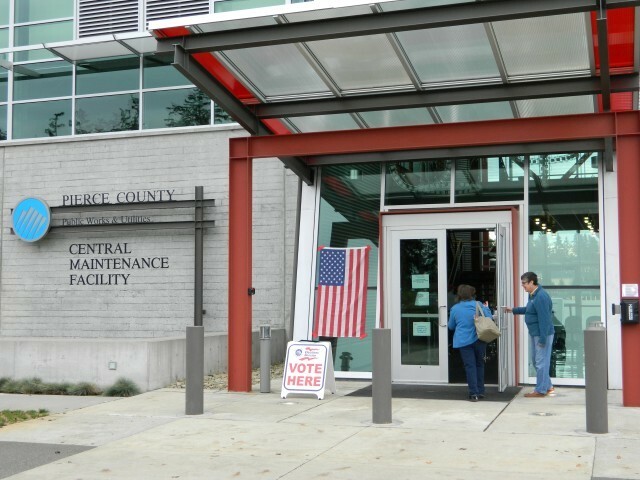 No lines or waiting greeted voters on Tuesday afternoon at the polling center set up inside Pierce County’s Maintenance Facility near Canyon Road and 192nd Street in Frederickson. Volunteers helped voters every step of the way, from the front door and down the hall, through the voting process, and quickly back out the front door. Voters initially approached the polling center with hesitation, but came out with smiles and an extra bounce in their step after navigating the process in an average of less than 10 minutes. Residents that had already completed their ballot and were just there to drop it off, simply followed the bright red arrows on the floor and volunteer instructions to the drop box, then given a “I Voted” sticker and kindly sent on their way. In and out in under two minutes. Others who did not have a ballot were checked in, handed a voters guide, and sent to the electronic voting booths along the walls to make their candidate selections. The atmosphere was upbeat and jolly throughout the polling center, but most notably at the entrance where one election volunteers kept the mood light and exciting. “Go down to those pretty ladies and they will check you in,” said one volunteer, pointing down the hallway toward the polling center. Another volunteer, greeting and thanking voters at the entrance, reminisced about the first time she voted in 1973. Even some children got in the voting spirit as entire families visited the facility to cast their votes, including one young couple who were first time voters. Volunteers said they had seen many first time voters this election and hoped to see more before the day ended. One father, on his way out after voting, said his daughter had given him “all the answers.” His daughter grinned as she skipped across the parking lot holding her father’s hand, wearing his “I Voted” sticker. This entry was posted in Culture, Frederickson, Josh Magill, Politics. Bookmark the permalink. I went there just to drop off my ballot. I assumed that I’d follow the cars in front of me and drop it in a mail box or hand it to some election worker. Not so. I apologized to the election workers as I entered the building with mud dripping from my boots. After following all of the arrows on the clean floor, I entered “election central”. Wow, was I surprised. This was kind of a big deal. Way more than I expected to find. Within seconds, I was able to deposit my ballot and drop more mud on their clean floors as I exited the building. It was simple and easy, but next time I’ll clean up a little more before I go..
Ah, “Muddy John,” is a nice nick-name. Be careful. It might stick. (smile). A recent reader questioned my use of the word “volunteer” in the article above when referring to poll workers. I appreciate the question and concern as I want my reporting to be accurate. My use of the word “volunteer” was not meant to infer that these poll workers were unpaid, as poll workers are paid a set amount for their time helping with the elections based on the position they work. In some areas across the nation, some college students volunteer as poll workers to receive course credits from state universities in lieu of monetary compensation. In the specific case for my article, I chose the term “volunteer” because that was the term used on the name badges worn by the poll workers. It seem appropriate to me as these poll workers showed such a passion to be there and were so excited to volunteer their time and effort. The term “volunteer” is often thought of as unpaid. Depending on the dictionary you consult, it is not specifically clear, but has been a term used when compensation is given because certain funding mandates it. For elections it is law that poll workers must be paid. Usually the pay is somewhere between $100-$250 based on the position worked for the day. Another example is when someone volunteers for a medical study, they are sometimes paid for their time and travel, usually because it is mandated by the funding they are receiving. Though they are being paid, they are volunteers. I appreciate the question this reader brought concerning this word because words matter. What we say and how we say it can determine such things as love and hate, peace or war, and even for whom we vote. Words are important to understand and use in the proper way.